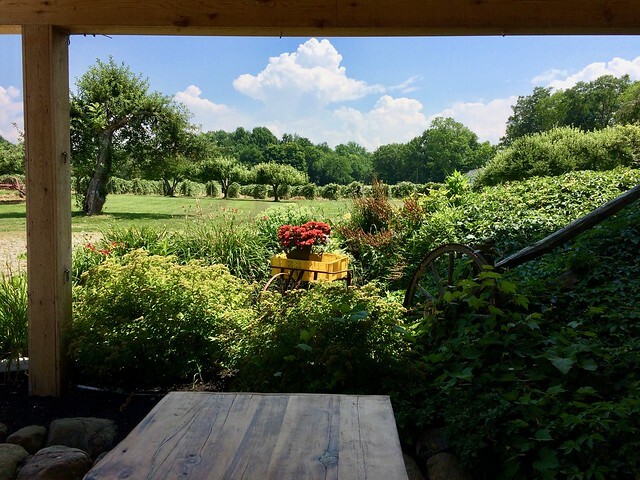 We had so many wine experiences during our summer trip to Pennsylvania that we still have a couple we haven’t told you about yet. 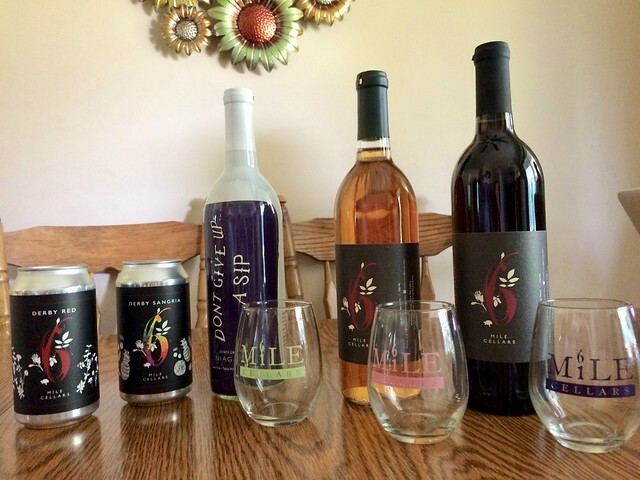 Today’s entry is about our wine tasting at 6 Mile Cellars with Aunt Kathy, Marilou and myself. 6 Mile Cellars is just down the road from Aunt Kathy’s house but strangely, we had never visited. That’s likely due to the fact that it’s only open on Saturday and Sunday, so we made a point to check it out during our past trip. 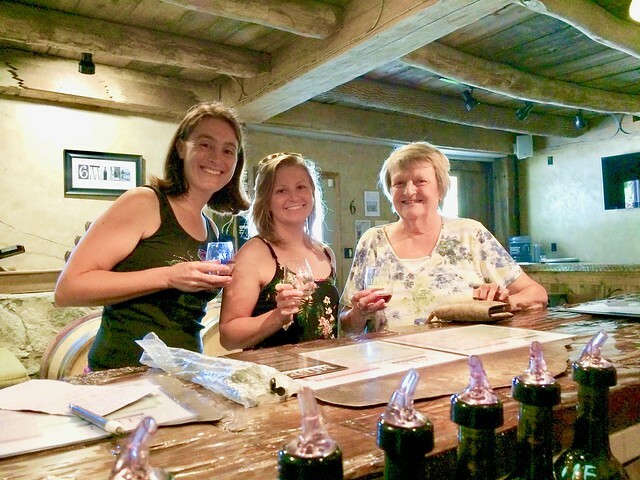 Although Aunt Kathy gets to enjoy the wines we bring back from the wineries, she’s never had the chance to come wine tasting with Neil and I. Neil’s sister, Marilou, was in town too so we decided to take a girls day out and enjoy a little vino. 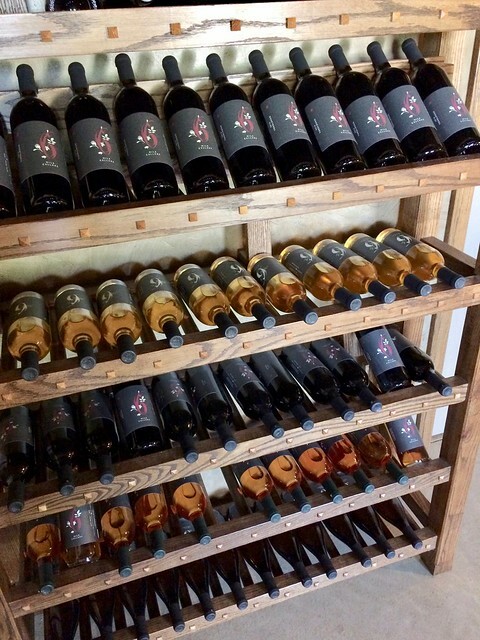 This winery is relatively new, having only opened in 2012. 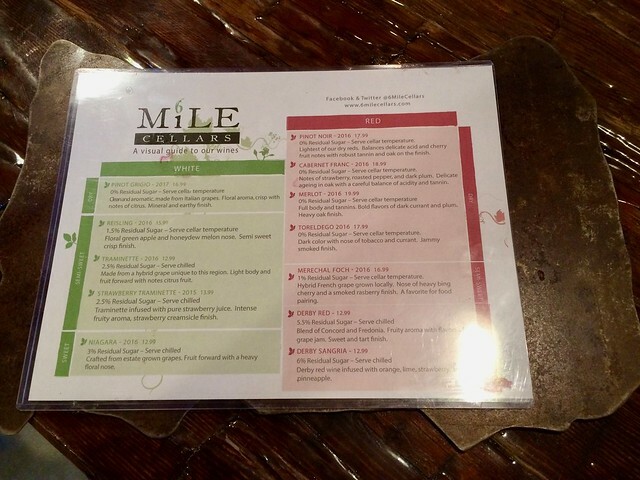 Curious about the name 6 Mile Cellars? It refers to the creek that runs just behind Aunt Kathy’s house (6 Mile Creek). We enjoyed seeing the grapes on the exterior of the tasting room but found out that they only grow Niagara grapes on their property. The rest of their grapes are purchased from neighboring vineyards including Mazza, Arundel, and 21 Brix*. When we arrived, we were the first people there to taste the wine but we happily signed up for the set of 5 wines for $5 which included our souvenir glasses. All of us chose different wines but I do have a list of a few of the wines Marilou and Aunt Kathy tried in addition to my own notes. I began my tasting with the Pinot Grigio. This wine had dry, pear aromas and a little bit of a toasted flavor. The other white wine that I tried was the Riesling. I mentioned in our entry about Johnson Estate Winery that I was doing a bit of an experiment and trying all the Riesling’s I came across during this trip. The Riesling at 6 Mile Cellars smelled floral but tasted like fruit and oak. Aunt Kathy tried the Niagara, that is grown on the property, and knew she liked it. She decided to take home a bottle of it that day. Marilou tried the Strawberry Traminette and decided it was just what she was looking for to sip on that Sunday afternoon. She brought home a bottle to share with her cousin. She also tasted both the Derby Red and Derby Red Sangria. I was familiar with the Derby Red after trying it a few times from relatives that live nearby. This wine is a blend of Concord and Fredonia grapes and I like that it’s both flavorful and light bodied. The Derby Red Sangria is a blend of the wine with fresh squeezed lemon, lime, orange, strawberries and pineapple juice. Both of these wines come in a can, and are so convenient, as well as tasty. It was an easy decision for Marilou to purchase both of those that day as well. 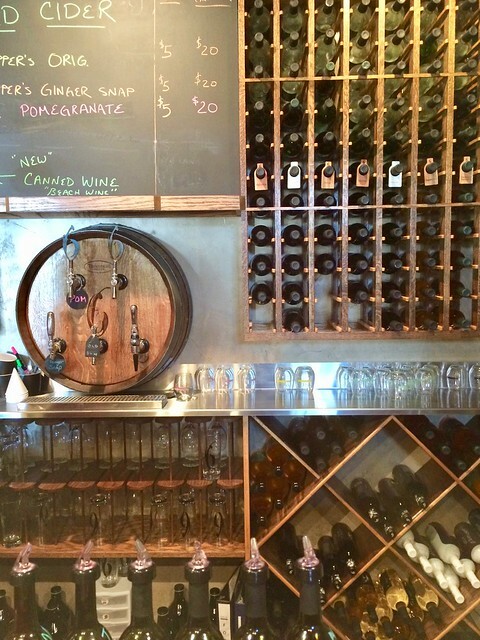 I had fun to watching them taste and enjoy their wines while I spoke with the tasting room associates and learned more about the winery. I found out that they use Hungarian Oak barrels because this type of oak has thicker grains. The wine can spend less time in the barrel for the same oak flavor that would take longer in other types of barrels. Pretty cool! Also 6 Mile Cellars is the same climate as Toreldego, Spain, I never would have guessed that. They were also excited to tell me that they are in the process of making some coffee wines in the future. How different! We’ve never tried anything like that before. I tried two red wines that day. My first red wine, Cabernet Franc, had berry and floral aromas. The flavor was light, with dark berries, black pepper and a hint of dryness. I liked it and decided I should purchase a bottle. The other red wine was Marechal Foch, one of the lesser known grapes that grows in this area. This wine had aromas of red licorice and flavors of cranberry, raspberry, and dark fruit. It was also a dry wine that I enjoyed. I finished out my tasting with the Old Snapper, Ginger Snap Cider. I’m not usually a fan of beer but it seemed like something that would have all my favorite flavors of Autumn. I really liked the apple pie aromas, bubbles, and light ginger snap flavor. It was very nice and fun to try something a little out of the ordinary. I’m glad I finally got to have a wine tasting experience with Marilou and Aunt Kathy and from the amount of wine we brought home, I’d say they liked it too. I even got a couple suggestions of other areas of the US that have wine trails to look for in the future. What a nice wine trip on a Sunday afternoon! 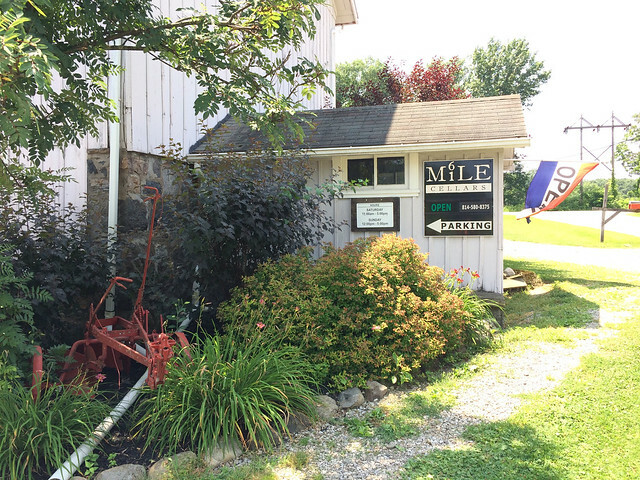 And now we’ve been to 6 Mile Cellars, a place we had driven by so many times and always wondered about.